Hank, depending on the number of hours on the generator and how old it is, it just may be time for a set-up/tune-up. All RV power plants require regularly scheduled maintenance. Adjustments to the carburetor and possibly the governor may be in order. A certified RV service technician can quickly diagnose the generator by connecting it to a device called a load bank. 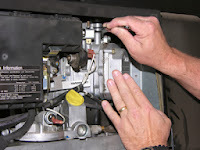 RV generators cannot be tuned or set-up by ear and I caution the service technicians I teach that every mechanical adjustment on the generator has a direct electrical consequence. Unfortunately, this one is better left to a pro technician because of the specialized equipment necessary to diagnose it. No load and full load voltages and frequencies must be within spec for the generator to carry a rated load. You can rule out a fuel issue by inspecting the fuel line from the tank connection to the generator connection. Old rubber fuel hoses can crack and begin sucking air, which could lead to operational ills when a load is applied. You might also try running the generator from a separate fuel source, then applying the load. If it quits again, you'll know the problem is in the generator and not the fuel supply.